Nature’s Plus T-Male has quickly become one of the best-selling natural testosterone boosting supplements of all time. If you’re curious as to why, then please see the T-Male reviews below. All T-Male reviews were posted on our online store within the past few months. These T-Male reviews are actual reviews written by actual customers. They have not been changed, altered, or hand-picked. Take your time reading the reviews. We will be posting updates from time to time. 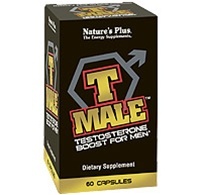 If you decide, based on the T-Male Reviews, that you’d like to give T-Male a try, you can buy Nature’s Plus T-Male here. “Fast service. Very happy with your company. Thank you”. “Delivered on time. Works great”. ***** 5 Stars ***** Yes. Buy It! “I’m not one to promote any one product. Except for this product Nature’s Plus T Male Testosterone Booster. In all areas T Male worked for me. My wife is happy, Im happy I feel so much better. I look more fit less fat being retained. I don’t work for these guys but I could make a lot of money if I did “. “This is my 3rd order from Arnold’s for T Male. Best price on the web. The stuff works. I suggest you go with the two caps, twice a day recommendation”. “showing improved thinking, not as much fatigue”. ***** 5 Stars ***** T-Male, Love it. “I love this stuff and the reason I know this is because I’ve been off it for three weeks and I can tell the difference of how I felt while on it”. “I am on day 3 (took 2 pills twice a day) as my Testosterone levels were in the 300’s which is way below normal even for a guy like me who is 38. I can already feel more libido and normalcy. I can only imagine what I’ll feel like in a week and returning to normal dose intake”. “The product is great, but your shipping time took too long. When I order products from other companies I get my product sometimes in 2 days after I order it”.